A standard rate turn is one in which the pilot will do a complete 360° circle in 2 minutes or 3 degrees per second. A standard rate turn, although always 3 degrees per second, requires higher angles of bank as airspeed increases. To enter a standard rate level turn, apply coordinated aileron and rudder pressures in the desired direction of turn. Pilots commonly roll into turns at a much too rapid rate. During initial training in turns, base control pressures on the rate of cross-check and interpretation. Maneuvering an airplane faster than the capability to keep up with the changes in instrument indications only creates the need to make corrections. A rule of thumb to determine the approximate angle of bank required for a standard rate turn is to use 15 percent of the true airspeed. A simple way to determine this amount is to divide the airspeed by 10 and add one-half the result. For example, at 100 knots, approximately 15° of bank is required (100 ÷ 10 = 10 + 5 = 15); at 120 knots, approximately 18° of bank is needed for a standard rate turn. On the roll-in, use the attitude indicator to establish the approximate angle of bank, and then check the turn coordinator’s miniature aircraft for a standard rate turn indication or the aircraft’s turn-and-bank indicator. Maintain the bank for this rate of turn, using the turn coordinator’s miniature aircraft as the primary bank reference and the attitude indicator as the supporting bank instrument. 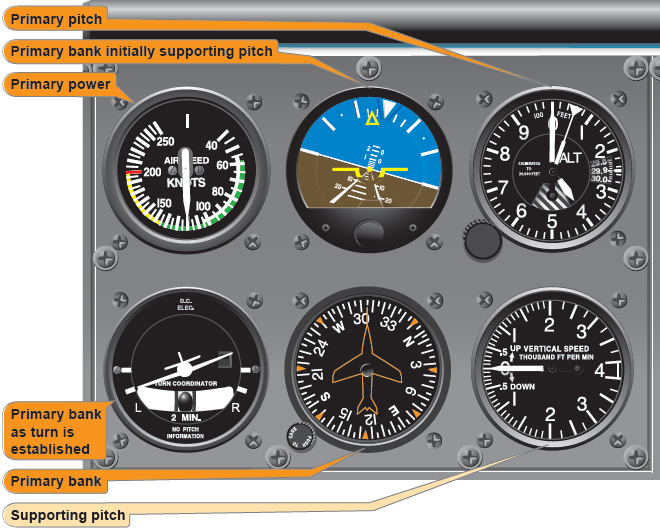 [Figure 7-33] Note the exact angle of bank shown on the banking scale of the attitude indicator when the turn coordinator indicates a standard rate turn. Figure 7-33. Standard rate turn, constant airspeed. During the roll-in, check the altimeter, VSI, and attitude indicator for the necessary pitch adjustments as the vertical lift component decreases with an increase in bank. If constant airspeed is to be maintained, the ASI becomes primary for power, and the throttle must be adjusted as drag increases. As the bank is established, trim off the pressures applied during pitch and power changes. To recover to straight-and-level flight, apply coordinated aileron and rudder pressures opposite to the direction of the turn. Strive for the same rate of roll-out used to roll into the turn; fewer problems are encountered in estimating the lead necessary for roll-out on exact headings, especially on partial panel maneuvers. Upon initiation of the turn recovery, the attitude indicator becomes the primary bank instrument. 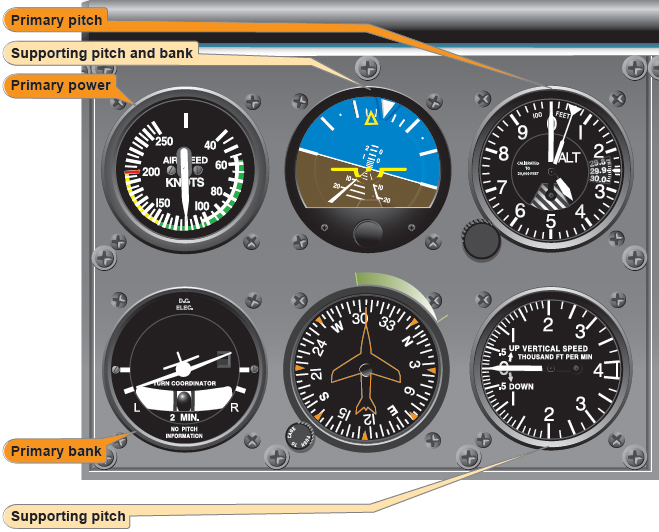 When the airplane is approximately level, the heading indicator is the primary bank instrument as in straight-andlevel flight. Pitch, power, and trim adjustments are made as changes in vertical lift component and airspeed occur. The ball should be checked throughout the turn, especially if control pressures are held rather than trimmed off. Some airplanes are very stable during turns, requiring only slight trim adjustments that permit hands-off flight while the airplane remains in the established attitude. Other airplanes require constant, rapid cross-check and control during turns to correct overbanking tendencies. Due to the interrelationship of pitch, bank, and airspeed deviations during turns, cross-check must be fast in order to prevent an accumulation of errors. As long as an airplane is in a coordinated bank, it continues to turn. Thus, the roll-out to a desired heading must be started before the heading is reached. The amount of lead varies with the relationship between the rate of turn, angle of bank, and rate of recovery. For small heading changes, use a bank angle that does not exceed the number of degrees to be turned. Lead the desired heading by one-half the number of degrees of bank used. For example, if a 10° bank is used during a change in heading, start the roll-out 5 degrees before reaching the desired heading. For larger changes in heading, the amount of lead varies since the angle of bank for a standard rate turn varies with the true airspeed. Practice with a lead of one-half the angle of bank until the precise lead a given technique requires is determined. If rates of roll-in and roll-out are consistent, the precise amount of lead suitable to a particular roll-out technique can be determined. A timed turn is a turn in which the clock and the turn coordinator are used to change heading by a specific number of degrees in a given time. For example, in a standard rate turn (3 degrees per second), an airplane turns 45° in 15 seconds; in a half standard rate turn, the airplane turns 45° in 30 seconds. Prior to performing timed turns, the turn coordinator should be calibrated to determine the accuracy of its indications. [Figure 7-34] Establish a standard rate turn as indicated by the turn coordinator, and as the sweep-second hand of the clock passes a cardinal point (12, 3, 6, 9), check the heading on the heading indicator. While holding the indicated rate of turn constant, note the indicated heading changes at 10 second intervals. If the airplane turns more than or less than 30° in that interval, a respectively larger or smaller deflection of the miniature aircraft of the turn coordinator is necessary to produce a standard rate turn. After calibrating the turn coordinator during turns in each direction, note the corrected deflections, if any, and apply them during all timed turns. Figure 7-34. Turn coordinator calibration. The same cross-check and control technique is used in making a timed turn that is used to execute turns to predetermined headings, except the clock is substituted for the heading indicator. The miniature aircraft of the turn coordinator is primary for bank control, the altimeter is primary for pitch control, and the ASI is primary for power control. Start the roll-in when the clock’s second hand passes a cardinal point, hold the turn at the calibrated standard rate indication (or half-standard rate for small heading changes), and begin the roll-out when the computed number of seconds has elapsed. If the rates of roll-in and roll-out are the same, the time taken during entry and recovery does not need to be considered in the time computation. Practice timed turns with a full instrument panel and check the heading indicator for the accuracy of turns. If the turns are executed without the gyro heading indicator, use the magnetic compass at the completion of the turn to check turn accuracy, taking compass deviation errors into consideration. 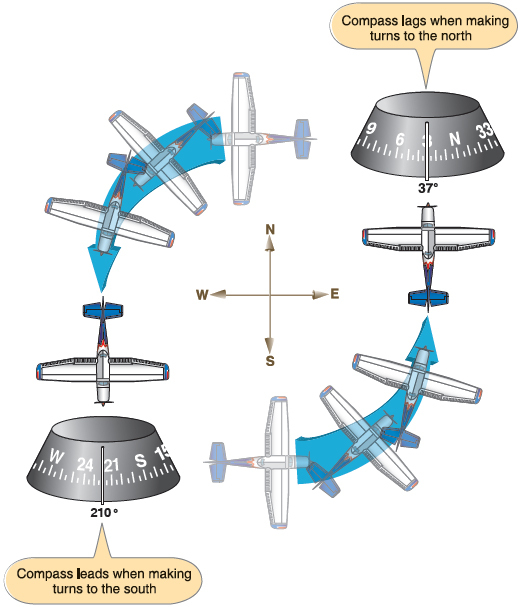 In most small airplanes, the magnetic compass is the only direction-indicating instrument independent of other airplane instruments and power sources. Because of its operating characteristics, called compass errors, pilots are prone to use it only as a reference for setting the heading indicator, but knowledge of magnetic compass characteristics permits full use of the instrument to turn the airplane to correct and maintain headings. If on a north heading and a turn is started to the east or west, the compass indication lags or indicates a turn in the opposite direction. If on a south heading and a turn is started toward the east or west, the compass indication precedes the turn, indicating a greater amount of turn than is actually occurring. When on an east or west heading, the compass indicates correctly when starting a turn in either direction. If on an east or west heading, acceleration results in a north turn indication; deceleration results in a south turn indication. When maintaining a north or south heading, no error results from diving, climbing, or changing airspeed. Figure 7-35. North and south turn error. For example, when turning from an easterly direction to north, where the latitude is 30°, start the roll-out when the compass reads 37° (30° plus one-half the 15° angle of bank, or whatever amount is appropriate for the rate of roll-out). When turning from an easterly direction to south, start the roll-out when the magnetic compass reads 203° (180° plus 30° minus one-half the angle of bank). When making similar turns from a westerly direction, the appropriate points at which to begin the roll-out would be 323° for a turn to north and 157° for a turn to south. When turning to a heading of east or west from a northerly direction, start the roll-out approximately 10° to 12° before the east or west indication is reached. When turning to an east or west heading from a southerly direction, start the rollout approximately 5 degrees before the east or west indication is reached. When turning to other headings, the lead or lag must be interpolated. Abrupt changes in attitude or airspeed and the resulting erratic movements of the compass card make accurate interpretations of the instrument very difficult. Proficiency in compass turns depends on knowledge of compass characteristics, smooth control technique, and accurate bank-and-pitch control.